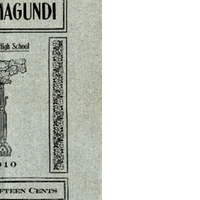 The 1910 Salmagundi was the first yearbook for Sanford High School. The yearbook was named after a Native American word meaning "a general mixture." Carrie Lovell was the editor-in-chief of the Salmagundi, which cost fifteen cents. It has 40 pages, six of which make up the advertisement section. Topics of interest in the yearbook include student writings, such as "American Endeavor Rules the World." There is a social section, as well as an athletic section, which discusses creating an athletic association at Sanford High School. Some photographss are featured of Sanford High School: the view from the top of the school, the graduating seniors, and the junior class in formal attire. Sanford High School was originally established at 301 West Seventh Street in Sanford, Florida, in 1902. The building was designed by W. G. Talley in the Romanesque revival style. Due to an increasing student population, a new school building was constructed on Sanford Avenue in 1911. The original building on Seventh Street served as Westside Grammar Elementary School, which was later renamed Sanford Grammar School. In 1984, the building was placed on the National Registry of Historic Places and converted into the Student Museum. The building reopened as the University of Central Florida's Public History Center in 2012. In 1927, a high school campus was designed by Elton J. Moughton in the Mediterranean revival style and constructed at 1700 French Avenue. The school reopened on January 10 and was renamed Seminole High School. In 1960, the high school moved to a new campus at 2701 Ridgewood Avenue and the former building on French Avenue was converted to Sanford Junior High School, which was later renamed Sanford Middle School. The old building was demolished in the summer of 1991 and replaced by a $5.77 million school complex. As of 2013, Seminole High School offers various Advanced Placement courses, the Academy for Health Careers, and the International Baccalaureate Programme for students. Original yearbook: Salmagundi, Vol. I, No. 1 (Sanford, FL: Irving Literary Society of Sanford High School, 1910). Digital reproduction of original yearbook: Salmagundi, Vol. I, No. 1 (Sanford, FL: Irving Literary Society of Sanford High School, 1910). Sanford High School Collection, box 1, Salmagundi 1910, UCF Public History Center, Sanford, Florida. Originally created by the Salmagundi Staff of 1910 and published by the Irving Literary Society of Sanford High School. Copyright to this resource is held by Seminole High School and is provided here by RICHES of Central Florida for educational purposes only. “Salmagundi, Vol. I, No. 1, 1910.” RICHES of Central Florida accessed April 24, 2019, https://richesmi.cah.ucf.edu/omeka/items/show/3921.